نمط جديد للتقدير الأني للبايروكتكول, ريزورسينول و البايروكالول في نماذج تجارية النقية بأستخدام التحليل بالحقن الجرياني المستمر عن طريق استخدام محلل طيفي مايكروي مصنع محليا Ayah 3SBGR x3-3D solar cell. A new, simple, accurate, fast and sensitive spectrophotometric method has been developed for the analysis of Pyrocatechol, Resorcinol, and pyrogallolin pure commercial samples by continuous flow injection analysis. The method was based on the oxidation of the organic compounds with Ce(IV)sulfate in acidic medium to formed a brown colored species which determined using homemade Ayah 3SBGR x3-3D solar cell flow injection microphotometer. Optimum conditions were obtained using a high intensity green light emitted diode as an irradiation source forPyrocatechol, Resorcinol, whileblue light emitted diode as an irradiation source for pyrogallol. The linear dynamic range for the instrument response versus Pyrocatechol, Resorcinol, and pyrogallol concentrationswere5-40mmol.L-1 while the L.O.D was of 36.63, 17.17, and 41.61ng / sample respectively. The correlation coefficient (r) was 0.9952, 0.9970, and 0.9960 while percentage linearity (r2%) was 99.05%, 99.41% and 99.22%forPyrocatechol, Resorcinol, and pyrogallol respectively. RSD% for the repeatability (n=8,7, and 8) was 1.4%, 0.63%, 1.78% for the determination of Pyrocatechol, Resorcinol,andpyrogallol, respectively at concentration of 30 mmol.L-1. The method was applied successfully for the determination of three organic compounds in purecommercial samples. A comparison was made between the newly developed method and the classical method (UV-Vis spectrophotometry) at wave length 492, 481, and 438 nm forPyrocatechol, Resorcinol and pyrogallolrespectively of analysis using the standard additions method via the use of paired t-test. It was noticed that there is no significant difference between two different methods for analysis three different organic compounds; in addition to no significant difference in the contribution of the Pyrocatechol, Resorcinol and pyrogallol to the oxidant reaction path, at 95% confidence level. طورت طريقة طيفية جديدة, بسيطة, سريعة, مظبوطة, وحساسة لتحليل البايروكتكول, الريزورسينول, والبايروكالول في نماذج تجارية نقية بأستخدام التحليل بالحقن الجرياني المستمر. استندت الطريقة على اكسدة المركبات العضوية بكبريتات السيريوم (IV) في الوسط الحامضي لتكوين اصناف ملونة بنية والتي قدرت بأستخدام مطياف مايكرويبالحقن الجرياني المستمر مع Ayah 3SBGR x3-3D solar cell المصنع محليا. تم دراسة الظروف الفضلى التي تم التوصل اليها بأستخدام ثنائي الوصلة باعث للضوء الاخضر وبشدة عالية كمصدر لتشعيعالبايروكتكول والريزورسينول, بينماثنائي الوصلة باعث للضوء الازرق وبشدة عالية كمصدر لتشعيع البايروكالول . المدى الخطي الفعال لعلاقة تغير الاستجابة الألية مع التركيز 5- 40 مللي مول.لتر-1 بينما حدود الكشف,17.17 ,36.63 41.61 ناغم / انموذج. وان معامل الارتباط (r) 0.9952, 0.9970, و 0.9960 بينما نسبة الخطية r2 % = 99.05, 99.41, و 99.22. الانحراف القياسي النسبي المؤي (RSD%) للتكرارية(n= 8,7,8)1.4, 0.63, 1.78 % لمحلول البايروكتكول, الريزوسينول, والبايروكالول بتركيز 30 مللي مول .لتر-1للبايروكتكول, الريزوسينول والبايروكالول طبقت الطريقة بنجاح لتقديرالمركبات العضوية الثلاثة في نماذج تجارية نقية. اجريت مقارنة بين الطريقة المطورة والطريقة التقليدية (مطيافية UV-Vis) عند طول موجي 438, 481,و 492 نانو متر للتحليل باستخدام منحني الاضافات القياس من خلال استخدام اختبار t- المزدوج. لوحظ انه لايوجد فرق جوهري بين الطريقتين لتحليل المركبات العضوية الثلاثة بالاضافة الى عدم الاختلاف في مساهمة كل من البايروكتكول , الريزورسينول و البايروكالول على مسار تفاعل الاكسدة عند مستوى قناعة 95%. Pyrocatechol --- Resorcinol --- Pyrogallol --- Flow injection analysis --- Spectrophotometry. A simple, fast, and sensitive batch and flow injection spectrophotometric methods have been developed for the determination of clonazepam(CZP) in pure form and in pharmaceutical preparations. The proposed methods are based on the oxidative coupling reaction of the reduced clonazepam using Zn powders and conc. HCl with payrocatechol and in the presence of ferric sulphate. The resulting reddish colored product had a maximum absorbance at 515 nm. The optimum reaction conditions and other analytical parameters have been evaluated . The linear ranges for the batch and FI methods determination of CZP were 0.5-32, 50-400 μg mL-1 and the detection limits were 0.193, 22.60 μg mL-1 for both methods respectively. Statistical analysis of the results and comparison with results by the British Pharmacopoeia method are also reported.تم تطوير طرق طيفية بسيطة وسريعة وحساسة تعتمد على طريقة الدفعة والحقن الجرياني لتقدير دواء كلونازيبام في شكله النقي و في المستحضرات الصيدلانية. تعتمد الطريقتين على تفاعل الازدواج التأكسدي للدواء المختزل بالزنك و بوجود حامض الهيدروكلوريك مع كبريتات الحديديك المائية وبايروكاتيكول حيث يتكون ناتج احمر ذائب في الماء يمتلك أقصى امتصاص عند طول موجي 515 نانومترًا. تم تثبيت المتغيرات الكيميائية والفيزيائية للحصول على أفضل حساسية و تطابقيه للنتائج. تم الحصول على منحنيات معايرة خطية من 0.5-32و50- 400مايكرو غرام مل- 1 مع قيم حد كشف 0.193 و 22.6 مايكرو غرام مل⁻¹ لكل من طريقة الدفعة والحقن الجرياني على التوالي. طبقت الطريقتين بنجاح في تقدير الدواء في المستحضرات الصيدلانية و كانت النتائج المستحصلة متوافقة مع النتائج المستحصلة من الطريقة القياسية المعتمدة من قبل دستور الأدوية البريطاني. New, simple and accurate batch and flow injection spectrophotometric methods have been developed for the determinationsof tetracycline hydrochloride (TCH) and doxycycline hyclate (DCH) in pharmaceutical preparations. The methods are based on diazotization of metchlopramide and coupling reaction with either TCH or DCH in alkaline medium to form yellow–orange water soluble dye with absorption maxima at 414 and 436 nm for TCH and DCH, respectively. A graphs of absorbance versus concentration show that Beer’s law was obeyed over the concentration ranges of 1 –52 µgmL-1 TCH and DCH for batch method and of 8 – 240 µg mL-1 TCH and 5 – 350 µgmL-1 DCH for FIA method. The limits of detection in batchmethods were 0.333 and 0.235µgmL-1for TCH and DCH respectively, and in FIA methods were 0.895, 0.612 µgmL-1for TCH and DCH respectively. Samplethroughputs in FIA procedures were 120 and 80samples per hour for TCH and DCH, respectively. Different chemical and physical experimental parameters affecting on the development and stability of the colored product were carefully studied and the proposed methods were successfully applied for determination of TCH and DCH in pharmaceutical preparations. يتضمن البحث تطوير طرائق بسيطة وجديدة وذلك باستخدام تقنية المطياف الضوئي بطريقة الدفعة والحقن الجرياني للتقدير الكمي لكل من التتراسايكلين هيدروكلورايد و الدوكسي سايكلين هايكلات في المستحضرات الصيدلانية .اعتمدت الطرائق على تفاعل الازودتة والازدواج بين الميتكلوربرمايد المؤزوت والتتراسايكلين والدوكسي سايكلين حيث تتكون نواتج من اصباغ الاوزو الملونة وذائبة بالماء اعطتا على قمة امتصاص عند طول موجي414 و436نانوميتر لكل من التتراسايكلين والدوكسي سايكلين على التوالي . تشير منحنيات الامتصاص مقابل التركيز بانقانونبيرينطبقضمنمدىالتركيز52-1و50-1 مايكروغرام لكل مل لكل من التتراسايكلين هيدروكلورايد والدكوكسي سايكلين على التوالي وبحدودكشف 0.333 و 0.235 مايكروغرام لكل مل للتتراسايكلين هيدروكلورايد والدوكسي سايكلين هيكلات على التوالي لطريقةالدفعة.امابطريقةالحقن- الجريانيفكانمدى التراكيز من 280-5 و350-5 مايكرو غرام لكل مل للتتراسايكلين هيدروكلورايد والدوكسي سايكلين هيكلات على التوالي، وحدود الكشفكانت0.895 و0.612 مايكروغرام لكل مل للتتراسايكلين والدوكسي سايكلين على التوالي، تمت دراسة الظروفالمثلى للمتغيراتالكيميائيةوالفيزيائيةبدقةوطبقتالطريقتينبنجاحعلى المستحضرات الصيدلانية الحاويةعلى التتراسايكلينهيدروكلورايد والدوكسي سايكلين هيكلات.وقورنتالنتائجالتيتمالحصولعليها معنتائجطرائقالتحليل القياسبةللادويةاعلاهواظهرتنتائجالمقارنةعدموجودفرق جوهري بين نتائج الطرائق المقترحة ونتائج الطريقة القياسية . Rheumatoid arthritis (RA) is a chronic inflammatory polyarithritic disease associated with remission and exacerbation with different immunological features.Rheumatoid factor(RF) screening test was used quantitatively and qualitatively using an enzyme immunoassay (EIA), RF-isotypes (RF-IgG, RF-IgM, RF-IgA) , Interleukin-18 (IL-18) and Interleukin – 18 binding protein (IL-18BP) were detected quantitatively usingenzyme linked immunosorbent assay(ELISA). Results indicated a 51% positivity in RF among RA patients and a prevalence of the RF-isotype (RF-IgM) with the highest level at (41.6±16.3 U/ml) (p < 0.05) among other RF-isotypes at a percentage of 85.5% , results also indicatedan elevated serum level of IL-18 and IL-18BP(225±24.8 pg/ml), ( 5.2 ± 2.1 ng/ml ) respectively compared to healthy control (HC)group (65±8.4 pg/ml )(p<0.01) , ( 2.9 ± 1.3 ng/ml ) (p<0.05) respectively, and ratio of IL-18/IL-18BP serum levels in RA patients were significantly higher than in HC group (p<0.05) which increased the importance of IL-18BP in therapeutic strategy. In conclusion RF-IgM may be an important complimentary detection method for RA among the other isotypes ,IL-18 with its IL-18BP may play an important role in RA which need to be further investigated.التهاب المفاصل الرثياني هو مرض التهابي مزمن يرتبط مع سكون وتفاقم للمرض بالتناوب مع ملامح مناعية مختلفة . فحص العامل الريماتويدي ( RA ) من خلال التحري عنه كميا ونوعيا باستخدام تقنية التحري المناعي الإنزيمي( EIA ) , أما العامل الريماتويدي الخاص بالأنواع (RF-isotypes, IgG,IgM,IgA) و الانترلوكين -18 (IL-18 )والبروتين الرابط للانترلوكين-18(IL-18BP )تم التحري عنها كميا باستخدام تقنية التحري المناعي الممتز المرتبط بالأنزيم (ELISA). أظهرت النتائج أن51% من المرضى كانت فحوصهم ايجابية لفحص ( RA ) مع غلبة العامل الريمايتودي الخاص ( RA-IgM)عند أعلى مستوى له ( 41.6±16.3 U/ml)(P< 0.05) أمام غيره من الأنواع وبنسبة مئوية مقدارها 85.5%. أظهرت النتائج أيضا ارتفاع المستوى المصلي ل (IL-18 )و(IL-18BP) (225 ± 24.8 pg/ml) (5.2 ± 2.1 ng/ml ) على التوالي مقارنة بمجموعة السيطرة (65 ± 8.4 pg/ml) (p<0.01) (2.9 ± 1.3 ng/ml)(P<0.05) على التوالي. إن نسبة المستوى المصلي IL-18/IL-18BP لدى مرضى التهاب المفاصل (RA) كانت أعلى من تلك التي وجدت لدى مجموعة السيطرة (P<0.05) مما يزيد من أهمية هذا البروتين في احتمالية استخدامه في إستراتيجية العلاج لهذا المرض. وكاستنتاج للدراسة نجد أنRF-IgM من الممكن أن يكون فحص تكميلي للتحري عن المرض دونا عن غيره من الأنواع وان IL-18 مع بروتينه IL-18BP ممكن أن يلعبان دورا مهما في مثل هذا المرض مما يتطلب تحريات أكثر في دوره بمرض التهاب المفاصل الرثياني. Rheumatoid arthritis --- Interleukine-18 --- Interleukine – 18 binding protein. In this paper, thirty six samples of canned vegetables were collected randomly from different markets in Baghdad city from October 2013 till March 2014. The study includes identifying the concentration of some heavy metals (lead, nickel, zinc and iron) by flameless atomic absorption spectrophotometery. It was found that the higher concentrations of heavy metals in canned vegetables, was lead 1.179 ppm in olive, nickel 0.9078 ppm in olive, while zinc 10.143 ppm green peas and iron 90.601ppm in white asparagus; but the lower concentrations represents with lead 0.0021 ppm in green asparagus, nickel 0.0202 ppm in mushroom, while zinc 0.528 ppm in white asparagus and iron 4.061 ppm in green peas. Canned food has been reported to be contaminated mainly by spores forming bacteria of the genera Bacillus main sources of a meal. The bacteria that reported in this study were bacillus spp. تم في هذا البحث, اخذ ستة وثلاثين عينة من الخضروات المعلبة وتجميعها من اسواق مختلفة في مدينة بغداد بشكل عشوائي خلال الفترة من شهر تشرين الاول 2013 لغاية شهر اذار 2014, حيث تضمنت الدراسة التحري عن تراكير بعض العناصر الثقيلة وهي (الرصاص و النيكل و الخارصين و الحديد) بوساطة جهاز الامتصاص الذري, وكانت التراكيز العالية التي تم تسجيلها في الخضروات المعلبة قد تمثلت, الرصاص (1.179 ppm) في الزيتون, النيكل (0.9078ppm ) في الزيتون, بينما الخارصين (10.143 ppm ) في البزاليا الخضراء والحديد سجل (90.601 ppm ) في الهليون الابيض. اما التراكيز القليلة فقد تم تسجيلها في العينات كالاتي, الرصاص سجل (0.0021 ppm ) في الهليون الاخضر, النيكل (0.0202 ppm) في الفطر, بينما كان الخارصين 0.528) (ppm في الهليون الابيض و الحديد كان (4.016) ppm في البزاليا الخضراء. الاغذية المعلبة عادة تكون ملوثة بالبكتريا من جنس bacillus spp.والتي تم عزلها في هذه الدراسة. Canned vegetables --- heavy metals --- bacterial contamination. In this study it was found that a significant decrease in the level of leptin in young Iraqi smokers (16+ 0.7ng/mL) compared to non smokers(24.2+ 4.5ng/mL) while, B2 microglobulin and CRPwas significantly increased in the smokers (1.2 + 0.3µg/mL), (4.07+ 0.02mg/L) respectively, compared to non smokers (0.6 + 0.9µg/mL) ,( 2.88+ 0.002mg/L) respectively, the presented data indicates the effect of smoking on these immunological markers. في هذه الدراسة وجد ان انخفاض معدل leptin انخفاضا معنويا بين المدخنين العراقين الشباب ( 16+ 0.7ng/mL ) مقارنة بغير المدخنين ( 24.2 + 4.5 ng / mL)، ينما ارتفع بفارق معنوى كل من مستوى البروتين B2 وال CRP بين المدخنين,( 4.07+0.02 mg/L) , ( 1.2 + 0.3µg/mL) على التوالي مقارنة بغير المدخنين (0.6 + 0.9µg/mL) ، ( 2.88+ 0.002mg/L) على التوالي، مما يؤكد تأثير التدخين على مستوى بعض المؤشرات المناعية. Hepatitis E (HE) is an inflammation of the liver caused by hepatitis E virus (HEV) infection. Iraq is one of the Asian countries with high incidence and prevalence of hepatitis. In this paper, HE prevalence will be determined in Al-Muthanna province /Iraq. Commercially available Micro-ELISA for marker of hepatitis E (HEV IgM, Foresight, USA) kit was used to test (270) patients for HEV IgM antibodies. Also (10) blood samples from normal healthy individuals were used as normal control in this study. Among the (270) analyzed serum samples, a total of (72) samples (26.66 %) were found to be positive for anti-HEV IgM antibodies, and all these patients were tested for confirmatory test at central public health laboratories (CPHL) in Baghdad province. These patients consist of (45) females and (27) males were all negative for routinely screened markers of Hepatitis A, Hepatitis B and Hepatitis C. The positive sera anti-HEV IgM also were tested for total serum bilirubin (TSB), alanine aminotransferase (ALT), aspartate aminotransferase (AST), and alkaline phosphatase (ALP) colorimetrically. The age ranged between (4-74) years old. Highly significant differences (χ2 =10.271, p ≤ 0.01) appeared among age groups. This study showed that the HEV IgM is more common among younger age group ( 15-24), with a percentage of )41.67%(. And higher in females (63%) than in males (37%).التهاب الكبد نمط إي هو التهاب الكبد الناجم عن الإصابة بفايروس التهاب الكبد نمط إي. العراق هو إحدى الدول الآسيوية التي تعاني من ارتفاع نسبة حدوث وانتشار التهاب الكبد. في هذه البحث سنعرف مدى انتشار هذا المرض في محافظة المثنى / العراق. باستخدام تقنية الامتزاز المناعي المرتبط بالإنزيم) (ELISA, تم الكشف عن الأجسام المضادة Anti-HEV IgM antibodies في مصل(270) مريضا. كما وشملت الدراسة أيضا (10) من الأفراد الأصحاء كمجموعة سيطرة. (72) مريضا (26.66 %) من أصل (270) مريضا اظهروا نتائج موجبة لفحص الأجسام المضادة Anti-HEV IgM antibodies . وتم اختبار جميع هؤلاء المرضى لاختبار تأكيدي في مختبرات الصحة العامة المركزية (CPHL) في محافظة بغداد. يتكون هؤلاء المرضى من(45) إناث و (27) ذكور اظهروا جميعا نتائج سالبة للفحص الروتيني لالتهاب الكبد الفايروسي نوع (أي٫ ب٫ ج) . تم الكشف عن مستويات إنزيمات وظائف الكبد في الأمصال الموجبة لفحص الأجسام المضادة Anti-HEV IgM antibodies. تراوحت الفئات العمرية للمرضى بين (4-74) سنة. ظهرت بين الفئات العمرية فروقا معنوية عالية (χ2 =10.271, p ≤ 0.01) . هذه الدراسة بينت إن HEV IgM هو أكثر شيوعا بين الفئة العمرية ( 15-24) بنسبة (41.67%) .. وأعلى في الإناث (63%) منها في الذكور (37%) . تأثير منظمات النمو (IBA و BA و CCC) في بعض الصفات الخضرية لثلاثة اصناف مهجنة من ال Lilium spp. L.
The present study was conducted in the nursery of Floriculture Unit, University of Baghdad in Iraq during September to December of 2013. Vernalized bulbs of hybrid lily cultivars were imported from the Netherlands. The experiments were included some hybrid lily cultivars which represent the main groups of lily (longiflorum hybrids, Asiatic hybrid and trumpet hybrids). The three lily cultivars named as Tiger (Oriental), Brunello (Asiatic) and White Heaven (Longiflorum) were sprayed two times, at five weeks after planting and at eight weeks after planting with a solution of Cycocel (100 mg /l), solution of Indole butyric acid (50 mg/l) and Benzyl adenine (50 mg /l). The results indicated that foliar spray with IBA lead to increase in plant height, leaf number, leaf area, fresh weight of leaf and stem and dry weight of stem in Brunello. It increased in plant height, leaf area, and fresh and dry weight of stem in White Heaven. Tiger Edition increased in fresh and dry weight of the bulb while decreasing in dry weight by the application of IBA. BA leads to increase in plant height, dry and fresh weight of a leaf, and leaf number in Brunello. It increased in dry weight of a leaf and bulb, and leaf area in Tiger Edition . Also increased in dry weight of stem and bulb, and fresh weight of bulb in White Heaven. While foliar spray with CCC lead to increase in leaf number, leaf area, dry weight of a leaf, dry and fresh weight of stem, and fresh weight of the bulb in Brunello. Dry weight of leaf, and dry and fresh weight of bulb increased in Tiger Edition . Also lead to decrease in fresh weight of a leaf, and increase in fresh and dry weight of bulb in White Heaven. From these results, Brunello was more responsive to PGRs. CCC more PGRs was affected on lily cultivars. اجريت التجربة في مشتل جامعة بغداد ,العراق. خلال الفترة من ايلول الى كانون الاول 2013. تم استيراد ابصال لأصناف مختلفة من الليليوم من هولندا.هذه الابصال تابعة للمجاميع ( Longiflorum hybrids , Asiatic hybrids و Trumpet hybrids).تم رش ثلاث اصناف وهي Tiger ,(Asiatic) Brunello ,(Longiflorum) White Heaven (Oriental) مرتين, في الاسبوع الخامس و الاسبوع الثامن من الزراعة ب 100 ملغ/لتر من ال Cycocel , 50 ملغ/ لتر من Benzyl adenine و 50 ملغ/ لتر من ال . Indole butyric acid بينت النتائج ان رش صنف ال Brunello بال IBA ادى الى زيادة بعدد الأوراق , مساحة ألورقة , الوزن الطري للأوراق و الساق ,و الوزن الجاف للساق, في حين سبب زيادة مساحة الورقة و الوزن الطري والجاف للساق في صنف ال White heaven. و ادت ايضا الى زيادة بالوزن الطري و الجاف للبصلة و نقصان بالوزن الجاف للورقة في صنف ال Tiger Edition . ان الرش بال BA ادى الى زيادة بالوزن الطري و الجاف للورقة , وعدد الاوراق في ال Brunello. و زيادة بالوزن الجاف للورقة و البصلة والمساحة الورقية بال Tiger Edition . وأدت ايضا الى زيادة بالوزن الجاف للساق و البصلة و الوزن الطري للبصلة في ال White heaven. بينما لوحظ ان الرش بال CCC ادى الى زيادة بعدد الاوراق , مساحة الورقة , الوزن الجاف للورقة , الوزن الطري والجاف للساق , و الوزن الطري للبصلة في ال Brunello. ادى رش ال CCC الى زيادة الوزن الجاف للأوراق , الوزن الطري و الجاف للبصلة في ال Tiger Edition . وعمل على نقصان بالوزن الطري للأوراق و زيادة بالوزن الطري و الجاف للبصلة في ال White heaven. نستنتج من هذه الدراسة ان Brunello هو اكثر الاصناف استجابة لمنظمات النمو. وان اكثر المنظمات تأثيرا هو ال CCC. ازالة عنصري الرصاص والكروم من مياه الفضلة الصناعية بوساطة عزلات محلية من بكتريا Citrobacter spp. Biosorption is an effective method to remove toxic metals from wastewaters. In this study biosorption of lead and chromium ions from solution was studied using Citrobacter freundii and Citrobacter kosari isolated from industrial wastewater. The experimental results showed that optimum grwoth temperature for both bacteria is 30oC and the optimum pH is 7 &6 for C. freundii and C. kosari respectively. While the optimum incubation period to remove Pb and Cr for C. freundii and C. kosari is 4 days and 3days respectively. Also the biosorption of Pb and Cr in mixed culture of bacteria and mixed culture of Pb and Cr was investigated. Result indicate that uptake of Cr and Pb for C.freundii, C. kosari and in mixes culture of both bacteria is 58%, 53% and 82% respectively for chromium in solution containing 1000ppm of Cr and 59%, 63% and 78% respectively for lead in solution containing 1000ppm of lead. But the uptake decreases in solution containing both heavy metals lead and chromium. الامتزاز عملية فعالة لازالة المعادن السامة من المياه الملوثة. لقد تم دراسة امتزاز كل من عنصري الرصاص و الكروم باستعمال سلالات من بكتريا Citrobacterfreundiiو Citrobacterkosariالمعزولة من مياه الفضلة الصناعية. لقد بينت النتائج ان درجة الحرارة 30°م هي الفضلى لنمو كلا العزلتين, والرقم الهيدروجيني الامثل لنمو العزلتين هو 6 و7 لبكتريا C.freundiiوC. kosari على التوالي. اما فترة الحضانة الملائمة لبكترياC.freundii و C. kosari فقد كانت 4 ايام و 3 ايام على التوالي. وايضا تم دراسة امتزاز عنصري الكروم والرصاص في وسط يحتوي على كلا العزلتين وايضا على وسط يحتوي على خليط من عنصري الرصاص والكروم. لقد بينت النتائج ان النسبة المئوية لازالة عنصري الكروم و الرصاص لبكترياC. freundiiو C. kosariوخليط العزلتين كانت 58%, 53%, 82% على التوالي بالنسبة لعنصر الكروم في وسط حاوي على 1000جزء بالمليون من الكروم اما بالنسبة للرصاص فقد كانت نسب الازالة 59%, 63%, 78% على التوالي في وسط حاوي على 1000جزء بالمليون من الرصاص اما الوسط الحاوي على خليط من الرصاص والكروم فقد كان الامتزاز اقل من الوسط الحاوي على احد العنصرين. Biosorption --- Lead --- Chromium --- C. freundii --- C. kosari. This study was aimed to investigate the effect of anti- type 4 pili antibody in prevention pulmonary infections caused by P. aeruginosa in vivo. This was achieved by Evaluation of biofilm formation by the microtiter plate method to select P.aeruginosa isolate with highest biofilm formation capacity, Extraction and the partial purification of type IV pili from the selected isolate, then Preparation of type IV pili antibodies by rabbit immunization. The lung histological sections of non immunized mice were severly damaged ,while the damage were markedly decrease in the lung of immunized mice with anti-type 4 pili antibody. تهدف الدراسة الى معرفة تاثير المصل المضاد لخمل النمط الرابع في الوقاية من الالتهاب الرئوي من قبل بكتريا P.aeruginosa وذلك بأختبار قابلية العزلات على تكوين الغشاء الحيوي باستعمال تقنية التصبيغ بالبنفسج البلوري في اطباق المعايرة الدقيقة واختيار العزلة الامثل المكونة للغشاء الحيوي الاسمك من بين جميع العزلات لاستخلاص بروتين خمل النمط الرابع ,تم استخلاص بروتين الخمل من العزلة الامثل وتنقيته جزئيا و استخدامه في تمنيع الحيوانات المختبرية (الارانب) للحصول على المصل المضاد لبروتين الخمل . اظهرت نتائج المقاطع النسجية لرئة الفئران حدوث ضرر كبير بالنسيج الرئوي للفئران الغير ممنعة بينما انخفض الضرر بشكل كبير في النسيج الرئوي للفئران الممنعة للاجسام المضادة لخمل النمط الرابع. In this study, A 320 clinical specimens were collected fromIntensiveCareUnits, Surgery and burn units in educational Ramadi hospital. The enrichment and isolation of A. baumannii from collected specimens led to isolate 30 bacterial strains from 337 bacterial isolates with rate (8.9%), which similar in morphology for that standard strains. The rate of A. baumannii isolated from burn specimens was 80%, the wound specimens (13.33%), and sputum (6.67% The study detect resistance of A. baumanniifor different antibiotics, All isolates showed multidrug resistant, the isolates was 100% resistant for Ampicillin, Cefazolin, Cefotaxime, Cloxacillin, Colistin and Trimethoprim, as showed high resistance to carbapenems reached to 80%, but it showed low resistance (20%) against Levofloxacin. So 100% of A. baumanniiisolates (n=30) were produced AmpC β-Lactamases which hydrolyze a broad-spectrum of cephalosporins, and 60% from isolates (n=18) were producedMetalo β-Lactamases (MBL) which hydrolyze a broad array of antimicrobial agents, including carbapenems.في هذه الدراسة جمعت320 عينة سريرية من عدة مرضى مقيمين في وحدات العناية المركزة والجراحة والحروق في مستشفى الرمادي التعليمي. أدى إثراء وعزل بكتيريا Acinetobacterbaumannii من العينات التي جمعت إلى عزل 30 سلالة بكتيرية سريريةمن مجموع337 عزلة بكتيريةوبنسبة (8.9%)، وقد كانت متشابهة مظهريا للسلالة النمطية. حيث كانت نسبةبكتريا A. baumanniiالمعزولة من إصابات الحروق (80%)، والجروح (13.33%)،والقشع (6.67%). كشفت الدراسة مقاومة سلالات A. baumannii المعزولة للمضادات الحيوية المختلفة، إذ أظهرت جميع العزلات مقاومة بنسبة (100%) للمضادات الحيوية Ampicillin و Cefazolin و Cefotaxime و Cefoxitin و Cloxacillin وColistin و Trimethoprim، بينما أظهرت العزلات مقاومة تجاه مضادات الكاربابينيم بنسبة 80%، في حين كانتمقاومتها منخفضة بنسبة 20% تجاه مضادLevofloxacin. كما تبين أن جميع عزلات A. baumannii(n=30) منتجة لإنزيمات AmpC بيتالاكتاميز المحللة لطيف واسع من السيفالوسبورينات، وان 60% من العزلات (n=18) كانت منتجة لإنزيمات البيتالاكتاميز المعدنية Metallo-β-Lactamases (MBLs) المحللة لمدى واسع من المضادات المتضمنة الكاربابينيم. The study aimed to determine the effect of soybean meal on the histological structure and some functional parameters of the thyroid gland was investigated in this study. For this purpose, 24 white male rats were divided into four groups each of six rats, as following (G1): normal control rats, at the prepubertal life stage, were dissected after 40 days from the weaning (i.e., from Postnatal Day "PND" 21), (G2): prepubertal rats, were treated with high dose of soybean meal "40% of daily diet" for 40 days after the weaning, (G3): normal control rats, at the postpubertal stage, were dissected after 40 days from the puberty (i.e., from PND 60), (G4): postpubertal rats, were treated with high dose of soybean meal (40%) for 40 days after the puberty. Phenotypic, histological and physiological changes were examined. The results reported that, consumption of soybean at prepuberty decreased the thyroid activity by the increasing of the cold "inactive" follicles, while at postpuberty, soybean caused hyperactivity of the thyroid which led to the hyperplasia and hypertrophy, then to the goiter, significant increase in the ratio of cold follicles in the (G2) and significant decrease in the (G4), significant decrease in the height of follicular cell in the (G2) and significant increase in the (G4), significant increase in the diameter of follicular lumen in the (G2) and significant decrease in the (G4). Also, soybean meal caused significant increase in the body weight and significant decline in (T3 and T4) hormones levels. From the results of the present study, it is concluded that the high doses of the soybean affect adversely the function and tissue of the thyroid at both life stages, pre and postpuberty.هدفت الدراسة الى معرفة تأثير كسبة فول الصويا على التركيب النسجي وبعض المعايير الوظيفية للغدة الدرقية. استخدم 24 جرذ ابيض ذكر لهذا الغرض ، قسمت الى اربعة مجاميع بمعدل ستة جرذان لكل مجموعة وكالاتي: مجموعة (1): مجموعة سيطرة لجرذان غير بالغة شرحت بعد 40 يوم ابتداءا من الفطام ( أي من عمر 21 يوم) ،مجموعة (2) : مجموعة جرذان غير بالغة عوملت بجرعة عالية من كسبة فول الصويا ( أي بنسبة 40% من الغذاء اليومي) لمدة 40 يوم بعد الفطام، مجموعة (3) : مجموعة سيطرة لجرذان بالغة ، شرحت بعد 40 يوم من البلوغ ( أي من عمر 60 يوم ) ، مجموعة (4) : مجموعة جرذان بالغة عوملت بجرعة عالية من كسبة فول الصويا ( أي بنسبة 40% من الغذاء اليومي ) لمدة 40 يوم بعد البلوغ ، درست التغيرات المظهرية والنسجية للغدة الدرقية ، كما تم دراسة التغيرات في تركيز الهرمونات ، اشارت النتائج الى ان استهلاك كسبة فول الصويا بجرع عالية تسبب بإنخفاض فعالية الغدة الدرقية بزيادة الجريبات الخاملة بمرحلة ماقبل البلوغ ، بينما بمرحلة مابعد البلوغ فأن كسبة فول الصويا بجرعها العالية تسببت بفعالية مفرطة للغدة الدرقية مما أدى الى الزيادة في حجم خلاياها وزيادة عددها واخيرا الى تضخم الغدة. زيادة معنوية بنسبة الجريبات الخاملة للمجموعة (2) وانخفاض معنوي للمجموعة (4) ، انخفاض معنوي بارتفاع الخلية الجريبية الدرقية للمجموعة (2) وزيادة معنوية للمجموعة (4) , زيادة معنوية بقطر التجويف الجريبي للمجموعة (2) وانخفاض معنوي للمجموعة (4) ، زيادة معنوية في وزن الجسم وانخفاض معنوي في مستوى الهرمونات الدرقية. وعليه يمكن الاستنتاج ان الجرع العالية من كسبة فول الصويا يؤثر سلبا على وظيفة ونسيج الغدة الدرقية بكلا المرحلتين ماقبل وبعد البلوغ. One of the major environmental problems is the pollution of water and soils by toxic heavy metals.The aim of current study was estimatation the ability of Eclipta alba plant for the removal of (Pb) from the polluted water by phytoremedation technique and study the effect of a number of parameters(Pb concentration, contact time and pHvalues). The plant showed higher removal efficiency (99.2%) after 7 days of treatment at 50ppm.The best removal efficiency of Pb 98.95% at 100ppm was occurred at pH7. The root ability to accumulate Pb was more than the shoot ability, after 7 days treatment of water and pH=7, they were 2852.5 mg/kg, 2497.5 mg/kg and 502.5 mg/kg in roots, stems and leaves respectively. These results showed that Eclipta alba can be used in biological treatment of polluted water.تعد مشكلة تلوث المياه والتربة بالعناصر الثقيلة السامة من اكبر المشاكل البيئية. هدفت الدراسة الحالية الى تقدير قابلية نبات الفريش في ازالة عنصر الرصاص من المياه الملوثة بواسطة تقنية المعالجة النباتية مع دراسة تأثير عدد من العوامل المتغيرة(تركيز الرصاص, زمن التلامس و الاس الهيدروجيني). اظهر النبات كفاءه ازالة عالية (99.2%) بعد مرور سبعة ايام من المعالجة عند التركيز 50 جزء بالمليون. ان افضل كفاءة ازالة لعنصر الرصاص(98.95%) عند التركيز 100 جزء بالمليون كانت عند الرقم الهيدروجيني 7. كما اظهرت الدراسة ان جذور النبات تمتلك قابلية اكبر لتراكم عنصر الرصاص مقارنة بالسيقان والاوراق, بعد مرور 7 ايام من المعالجة وعند الرقم الهيدروجيني 7,اذ بلغ 2852.5 ملغم/كغم و 2497.5 ملغم /كغم و 502.5 ملغم /كغم على التوالي. من خلال هذه النتائج يمكن استخدام نبات الفريش في المعالجة البايولوجية للمياه الملوثة. Eclipta alba --- phytoremediation --- lead --- industrial waste water. The results of the phytochemical analysis of the crude aqueous and methanolic extracts of Myrtle (Myrtus communis), peppermint (Mentha piperita) and Sweet basil (Ocimum basilicum) contain active compounds : Phenols, Flavonoids and Tannins and missing of Steroids and Coumarines in all extract but Saponins and Alkaloids found in methanolic extract only, while terpens were present in peppermint and basil and absent in Myrtle. Administrating to animals with different extracts showed no effect on serum Acetylcholinesterase (AchE) compared with these fed on ethanol liquid diet, Methanolic and aqueous extracts of Myrtle, peppermint and basil in the serum of decreased Acetylcholinesterase level significantly(p≤0.05) [(1.25 ∆pH/30 min, 1.23 ∆pH/30 min, 1.28 ∆pH/30 min, 1.20 ∆pH/30 min, 1.26 ∆pH/30 min, 1.28 ∆pH/30 min), liver (0.35 ∆pH/30 min, 0.34 ∆pH/30 min, 0.34∆pH/30 min, 0.36∆pH/30 min, 0.42∆pH/30 min, 0.39∆pH/30 min) and brain (0.32∆pH/30 min, 0.37∆pH/30 min, 0.39∆pH/30 min, 0.36∆pH/30 min, 0.34∆pH/30 min, 0.37∆pH/30 min)] respectively compared with animals fed on ethanol liquid diet [(1.37 ∆pH/30 min), (0.47 ∆pH/30 min), (0.45 ∆pH/30 min)] respectively. نتائج التحليل الكيميائي للمستخلصات المائية والمثانولية للمستخلصات الخام للأوراق الأس والنعناع والريحان تحتوي على المركبات النشطة: الفينولات، الفلافونويدات والعفصيات وفقدها الى السترويدات والكومارينات اما القلويدات والصابونين فانه موجود في المستخلص الكحولي فقط ومن ناحية أخرى فان التربينات موجودة في المستخلص الخام لأوراق النعناع والريحان ولا توجد في المستخلص الخام لأوراق اﻵس. أظهرت نتائج معاملة الحيوانات المختبرية بالمستخلصات المختلفة (مقارنة سالبة) عدم وجود فرق معنوي في التأثير على انزيم الاسيتل كولين استريز في الدم بالمقارنة مع النظام الغذائي الايثانولي السائل . أدت المعاملة بالمستخلصات الكحولية والمائية للأس والنعناع والريحان إلى انخفاض معنوي بمستوى انزيم الاسيتل كولين استريز في مصل الدم] ( 1.25 ∆pH/30 دقيقة , 1.23 ∆pH/30 دقيقة , 1.28 ∆pH/30 دقيقة , 1.20 ∆pH/30 دقيقة , 1.26 ∆pH/30 دقيقة , 1.28 ∆pH/30 دقيقة ) والكبد (0.35 ∆pH/30 دقيقة , 0.34 ∆pH/30 دقيقة , 0.34 ∆pH/30 دقيقة , 0.36 ∆pH/30 دقيقة , 0.42 ∆pH/30 دقيقة , 0.39 ∆pH/30 دقيقة ) والدماغ (0.32 ∆pH/30 دقيقة , 0.37 ∆pH/30 دقيقة , 0.39 ∆pH/30 دقيقة , 0.36 ∆pH/30 دقيقة , 0.34 ∆pH/30 دقيقة , 0.37 ∆pH/30 دقيقة ) [على التوالي , بالمقارنة مع الحيوانات التي تغذت على النظام ألغذائي الايثانولي السائل ](1.37 ∆pH/30 دقيقة ) , (0.47 ∆pH/30 دقيقة) , (0.45 ∆pH/30 دقيقة) [على التوالي . plants crude extracts --- AchE --- ethanol liquid diet --- Albino mice. The reduced electric quadrupole transition strengths B(E2) from the first excited 2+ state to the ground 0+ state of some even-even Neon isotopes (18,20,22,24,26,28Ne) have been calculated. All studied isotopes composed of 16O nucleus that is considered as an inert core and the other valence particles considered to move over the sd-shell model space within 1d5/2, 2s1/2 and 1d3/2 orbits. The configuration mixing shell model with limiting number of orbitals in the model space outside the inert core fail to reproduce the measured electric transition strengths. Therefore, and for the purpose of enhancing the calculations, the discarded space has been included through a microscopic theory which considers a particle-hole excitations from the core orbits and from the model space orbits into the higher orbits with excitations. These effects are called core-polarization effects. The transition strengths have been calculated with effective nucleon charges deduced from the core polarization calculations, and calculated with standard effective nucleon charges for the proton and for neutron. The calculations are based on sd-shell model space with USDB interactions. The harmonic oscillator potential is used to generate the single particle matrix elements, where the value of the size parameter b is adjusted to get the experimental root mean square matter radii for each isotope. تم حساب قوى الانتقالات الكهربائية رباعية الاقطاب المختزلة B(E2) من المستوي المتهيج الاول 2+ الى المستوي الأرضي 0+ لبعض نظائر النيون الزوجية – زوجية (18,20,22,24,26,28Ne). ان جميع النظائر المدروسة تتشكل من نواة 16O والتي افترض على انها قلب خامل اضافة الى جسيمات خارج هذا القلب افترض بأنها تتحرك ضمن أنموذج فضاء القشرة sd وفي المدارات 1d5/2, 2s1/2 و 1d3/2. ان أنموذج القشرة مختلط التشكيلات والذي يحتوي على عدد محدد من المدارات في أنموذج الفضاء خارج القلب الخامل يفشل في تفسير نتائج قوى الانتقالات الكهربائية المقاسة عمليا. لذلك ولغرض تحسين الحسابات, تم تضمين الفضاء المستثنى والذي يضم مدارات القلب الخامل والمدارات العليا في نظرية مجهرية تفترض استثارة زوج (جسيم - فجوة) من مدارات القلب ومدارات أنموذج الفضاء بطاقة استثارة مقدارها حيث تدعى هذه العملية (تأثير استقطاب القلب). ان قوى الانتقالات المختزلة تم حسابها بدلالة شحنات النيوكليون الفعالة والمستنبطة من حسابات استقطاب القلب, كما وتم حسابها بدلالة شحنات النيوكليون القياسية والتي مقدارها للبروتون و للنيوترون. ان الحسابات تم اجراءها ضمن أنموذج فضاء القشرة sd وبتفاعل USDB. استخدم جهد المتذبذب التوافقي في توليد عناصر المصفوفة للجسيمة المفردة حيث افترضت قيمة مناسبة للثابت التوافقي b لكل نظير وذلك لإعادة توليد معدل الجذر التربيعي لإنصاف الاقطار المادية أو الكتلية. electric quadrupole transition --- transition strength --- even-even Neon isotopes. This study deals with the petrology of Injana Formation (Upper Miocene) at Zawita, Amadia and Zakho areas. The sandstone of Injana Formation is of two types namely, litharenite and feldspathic litharenite. The rock fragments of Injana Formation are mostly sedimentary and hence the sandstones are classified as sedarenite and more specifically chert arenite owing to the predominance of chert rock fragments. The sandstone is mineralogically submature ranging from mechanically and chemically stable to unstable. The petrographic studies reveal nearness of source area with arid to semi-arid climate. The source rocks are sedimentary, low- to medium-grade metamorphic and basic volcanic rocks. They are mostly supplied from the rising mountain farther north and east (Taurus and Zagros Ranges) during the Alpine Orogeny induced by the continent-continent collision between Arabia and Eurasia.The mudstone consists of mixture of clay and silt with variable percentages. The major clay minerals are chlorite, kaolinite and mixed-layer illite-smectite. The non-clay minerals are calcite, quartz and subordinate feldspars. تضمنت هذه الدراسة صخارية تكوين انجانه(Upper Miocene) في منطقة زاويته, عمادية وزاخو. الصخور الرملية في تكوين انجانه نوعان هما(litharenitand feldspathic litharenit) . القطع الصخريه لتكوين انجانه معظمها رسوبية والصخور الرملية هيSadarenite واكثر تحديداchertarenite هي نظرا لغلبة حجر الصوان في القطع الصخرية. الصخور الرملية هي معدنيا غير ناضجة وتتراوح ميكانيكيا وكيميائيا من مستقرة الى غير مستقرة. الصخور الرملية تتكون من خليط من الطين والطمى بنسب متغيرة. المعادن الطينية الرئيسيه هي chlorite, kaolinit and mixed – layer illite/smectite والمعادن غير الطينية هي calcite, quartz and feldspar . تكشف الدراسات الصخريه القرب من منطقة المصدر وان المناخ يكون من جاف الى شبه جاف. الصخور المصدرية هي صخور رسوبية ومتحولة من منخفضة الى متوسطة الدرجة والبركانيه القاعدية. يكون تجهيز هذه الصخور في الغالب من جبال شمال شرق نطاق طوروس وزاكروس اثناء تكون جبال الالب الناجمة من تصادم قارة مع قارة بين المملكة العربية واوراسيا. الصخور الطينية تتكون من مزيج من الطين والغرين وبنسب متغايرة. المعادن الطينية الرئيسية هي الكلورايت والكاؤلونايت mixed-layer illite-smectite , اما المعادن غير الطينية هي الكالسايت والكوارتز والفلدسبار. Injana Formation --- Petrography of sandstones --- Mineralogy maturity --- Provenance and tectonic setting --- Mineralogy of mudstones. Three formations to be studied along Surdash, Qallat, Khalakan, Hezob, Sektan, Degala and Shaqlawa areas in the Sulaimaniya and Erbil governorates, NE Iraq. These are: Dokan, Gulneri and Kometan formations. The paleoecology and depositional environment of these formations are determined by studying the ecology of the planktonic and benthic foraminifera. The depositional environment of are ranged from the continental shelf to the abyssal, and the paleotemperature, salinity and paleoclimate were discriminated in each section along the study area. تم في هذا البحث دراسة البيئة القديمة لثلاثة تكاوين في مناطق سورداش , قلات , خله كان , هيزوب , سيكتان , ديكله و شقلاوة, هذه التكاوين هي: تكوين دوكان وتكوين كلنيري وتكوين كوميتان . البيئة القديمة والبيئات الترسيبية لهذه التكاوين جرى تحديدها من خلال دراسة بيئات معيشة الفورامنيفرا الطافية والقاعية. البيئات الترسيبية تراوحت بين بيئة الرف القاري حتى بيئة الأعماق السحيقة كذلك تم تحديد درجة الحرارة القديمة , الملوحة والمناخ القديم في كل مقطع على امتداد منطقة الدراسة. 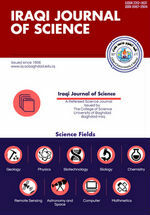 Sediments samples from ten stations along the Euphrates River and seven samples from selected springs within Al –Anbar governorate, (western part of Iraq), were collected and analyzed for radioactivity. Sediments samples were dried at 100 ºC for 24 hours. Radioactivity in 1 kg of each sample was measured using gamma spectrometer system based on a pure germanium detector with efficiency 30%. The activity of Ra-226, Th-232, K-40 were measured to be within the typical average of the radioactivity in sediment in world rivers, while relatively elevated concentration were found in the sediment of some of the studied spring. In current study activity concentrations of Cs-137 in the sediments were detected which may be caused by the global fallout as well as caused by transferring of cesium from the relatively high concentration areas in western desert by the rainwater within the valleys to the sediments of the Euphrates. The radiological aspects were investigated by calculating the radiological hazard indices such as absorbed dose rate, annual effective dose equivalent, hazard indices and gamma index. The radiological hazard indices were below the recommended international values. Ra-226 and Cs-137 concentrations in water and radiation doses due to drink water of the Euphrates River were estimated. The maximum estimated interior doses which caused by 137Cs and 226Ra in water were found to be 1.93 x 10-5mSv/y and 4.01x10-3 mSv/y, respectively.جرى اختيار نماذج رواسب من عشرة محطات على طول نهر الفرات وسبعة نماذج اخرى من ينابيع مختارة ضمن محافظة الانبار(غربي العراق) وجرى تحليلها اشعاعيا. جرى تجفيف نماذج الرواسب تحت حرارة 100 درجة مئوية لمدة 24 ساعة. وجرى تعين النشاط الاشعاعي في 1كغم من كل نموذج باستخدام منظومة تحليل اطياف كاما المستندة الى عداد الجرمانيوم عالي النقاوة ذي الكفاءة 30%. كانت نتائج قياس النشاط الاشعاعي للراديوم-226 والثوريوم-232 والبوتاسيوم-40 ضمن معدل النشاط الاشعاعي للرواسب للانهار العالمية. بينما كانت هناك تراكيز مرتفعة نسبيا في رواسب الينابيع. كما وجد في الدراسة الحالية ان هناك تراكيز للسيزيزم-137 في رواسب نهر الفرات والتي قد تكون من نتائج المتساقطات نتيجة التفجيرات والحوادث النووية على مستوى العالم او قد تكون قد انتقلت من مناطق ذات التراكيز العالية نسبيا في المنطقة الغربية من العراق عن طريق مياه الامطار الجارية في الوديان والتي تصب في نهر الفرات. جرى تقييم المخاطر الاشعاعية نتيجة لوجود التراكيز المقاسة للنويدات المشعة اعلاه عن طريق حساب بعض معاملات المخاطر الاشعاعية مثل معدل الجرع الاشعاعية، والجرعة المكافئة اللمؤثرة السنوية، ومعاملات المخاطر ومعامل كاما. كانت معاملات المخاطر الاشعاعية اقل من قيم الحدود العالمية الموصى بها. كما جرى تخمين تراكيز الراديوم-226 والسيزيوم-137 في مياه نهر الفرات والجرع الاشعاعية الناجمة عن استهلاك تلك المياه للشرب. وكانت اقصى الجرع الاشعاعية الناجمة عن وجود السيزيوم-137 الراديوم -226 في مياه نهر الفرات هي 1.93 * 10-5 و 4.0 * 10-3 ملي سيفرت/سنة على التوالي. In the present paper, the concepts of a quasi-metric space, quasi-Banach space have been introduced. We prove some facts which are defined on these spaces and define some polynomials on quasi-Banach spaces and studied their dynamics, such as, quasi cyclic and quasi hypercyclic. We show the existence of quasi chaotic in the sense of Devaney (quasi D-chaotic) polynomials on quasi Banach space of q-summable sequences lq , 0 <1 such polynomials P is defined by P((xi)i)=(p(xi+m))i where p:CC, p(0) = 0. In general we also prove that P is quasi chaotic in the sense of Auslander and Yorke (quasi AY-chaotic) if and only if 0 belong to the Julia set of p, mN. And then we prove that if the above polynomial P on lq , 0 <1 is quasi AY-chaotic then so is P where R+ with 1 and Pn for each n2.في هذا البحث تم تقديم المفاهيم الخاصة بشبه فضاء متري وشبه فضاء بناخ ومن ثم برهان بعض الحقائق المعرفة على هذه الفضاءات, حيث تم تعريف بعض متعددات الحدود المعرفة على فضاءات شبه بناخ ومن ثم دراسة ديناميكيتها مثل الشبه دوارية والشبه فوق الدوارية. لقد لاحظنا الوجود لشبه الفوضوية (نسبة الى Devaney) لمتعددات الحدود P على فضاء شبه بناخ lq عندما 0 <1 حيث P معرفة P((xi)i):=(p(xi+m))i، p:CC بحيث . بصورة عامة تم اثبات ان P هي شبه فوضوية (نسبة الى Auslander و York) اذا وفقط اذا كان الصفر ينتمي الى مجموعة جوليا J(p) لكل . كذلك برهنا انه اذا كانت متعددة الحدود اعلاه P على lq عندما 0 <1 هي شبه فوضوية (نسبة الى Auslander و York) فأن و Pn تكون كذلك حيث , لكل . Quasi-Banach space --- Polynomials --- Quasi Hypercyclic --- Quasi Chaos --- Julia set. The purpose of this paper is to give the condition under which every weakly closed function is closed and to give the condition under which the concepts of weakly-semi closed function and weakly pre-closed function are equivalent. Moreover, characterizations and properties of weakly semi closed functions and weakly pre-closed function was given. والغرض من هذا البحث هو إعطاء الشروط التي بموجبها يمكن اعتبار كل دالة مغلقة ضعيقة دالة مغلقة واعطاء الشروط التي تحتها يتكافء مفهومي الدوال شبه المغلقة الضعيفة والدوال قبل المغلقة الضعيفة. وعلاوة على ذلك، أعطيت بعض الأوصاف والخصائص لمفهومي الدوال شبه المغلقة الضعيفة والدوال قبل المغلقة الضعيفة. weakly closed function --- pre-closed set --- Gδ set --- nd-preserving function. In this paper we give many connections between essentially quasi-Dedekind (quasi-Dedekind) modules and other modules such that Baer modules, retractable modules, essentially retractable modules, compressible modules and essentially compressible modules where an R-module M is called essentially quasi-Dedekind (resp. quasi-Dedekind) if, for all N ≤e M (resp. N ≤ M). Equivalently, a module M is essentially quasi-Dedekind (resp. quasi-Dedekind) if, for each , Kerf ≤ e M implies f = 0 (resp. implies ). نحن أعطينا العديد من العلاقات بين المقاسات شبه الديديكاندية الواسعة (المقاسات شبه الديديكاندية ) وأنواع أخرى من المقاسات , كمثال : مقاسات Baer , المقاسات القابلة للانسحاب, المقاسات القابلة للانسحاب الواسعة, المقاسات القابلة للانضغاط و المقاسات القابلة للانضغاط الواسعة , حيث يسمى المقاس M على الحلقة R مقاس شبه- ديديكاندي واسع ( شبه ديديكاندي) إذا كان لكل مقاس جزئي واسع N من M (لكل مقاس جزئي N من M، على التوالي). يكافىء، المقاس M يُدعى مقاس شبه ديديكاندي واسع ( مقاس ديديكاندي، على التوالي) اذا كان لكل ، Kerf ≤ e M يؤدي الى ، على التوالي). Essentially quasi-Dedekind modules --- Baer modules --- retractable modules --- compressible modules --- monoform modules. Achieving energy-efficient Wireless Sensor Network (WSN) that monitors all targets at all times is an essential challenge facing many large-scale surveillance applications.Single-objective set cover problem (SCP) is a well-known NP-hard optimization problem used to set a minimum set of active sensors that efficiently cover all the targeted area. Realizing that designing energy-efficient WSN and providing reliable coverage are in conflict with each other, a multi-objective optimization tool is a strong choice for providing a set of approximate Pareto optimal solutions (i.e., Pareto Front) that come up with tradeoff between these two objectives. Thus, in the context of WSNs design problem, our main contribution is to turn the definition of single-objective (SCP) into a multi-objective problem by adopting an additional conflicting objective to be optimized. To the best of our knowledge, improving coverage reliability of WSNs has not been explored while simultaneously solving SCP problem. This paper addresses the problem of improving coverage reliability of WSNsusing a realistic sensing model to handle coverage uncertainty. To this end, this paper formulates the so-called multi-objective SCP with the goal of selecting the minimum number of sensors so that the selected set reliably covers all the targets.To cope with two optimization objectives rather than one objective, this paperinvestigates the use of a multi-objective evolutionary algorithm, the so-called non-dominated sorting genetic algorithm for tackling the formulated problem. Moreover, it adopts a heuristic crossover operator designed specifically to improve the performance of the algorithm.The effectiveness of the algorithm is verified in terms of sensors cost and coverage reliability under extensive simulations.تحقيق شبكة الاستشعار اللاسلكية (WSN) الموفرة للطاقة و التيتراقب جميعا لأهداف وفي جميعا لأوقات هو التحدي الأساسي الذي يواجه العديد من تطبيقات المراقبة وعلى نطاق واسع. تعتبر مشكلة تغطية المجموعة (SCP) وحيدة الهدف مشكلة أمثلية hardNP-وتستخدم لتحديد مجموعة من الحد الأدنى من أجهزة الاستشعار النشطة لتغطية جميعا لمنطقة المستهدفة وبكفاءة. وإذا أدركن اأن تصميم WSN كفوء في استخدام الطاقة وبنفس الوقت توفير تغطية موثوقة هي في المنطق متناقضة مع بعضها البعض ، فأن الأمثلية متعددة الأهداف تعتبر خيار قوي لتوفير مجموعة من الحلول المثلى والتي تسمى باريتوالتقريبية (أي جبهة باريتو) والتي تأتي بالمفاضلة بين هذين الهدفين. في سياق مشكلة تصميم WSNs، ذا البحث يهدف (وعلى حدعلمنا لأول مرة) الىتحويل تعريف مشكلة تغطية الجموعة من مشكلة وحيدة الهدف (SCP) الىمشكلة متعددة الأهداف من خلال اعتماد طبيعة الأهداف المتضاربة . ويتناول هذا البحث مشكلة تحسين موثوقية تغطية الشبكة باستخدا منموذج أستشعار واقعيا لتعامل معحالة عدم اليقين في التغطية .ولهذه الغاية ، تم صياغة المشكلة بنموذج مايسمى متعددة الأهداف وذلك بهدف اختيار أق لعدد من أجهزة الاستشعار وبشكل موثوق تقوم بتغطية جميع الأهداف .في هذا البحث تم استخدام خوارزمية تطورية متعددة الأهداف ، والمعروفة بأسم الخوارزمية الجينية ذات الترتيب غير المهم ين لحلا لمشكلة. وعلاوة على ذلك، تم أقتراح مشغل خلط توجيه يصمم تخصيصا لتحسين أداء الخوارزمية. يتم التحقق من فعالية الخوارزمية من حيث التكلفة والموثوقية في التغطية تحت محاكاة واسعة النطاق. non-dominated solution; NSGA-II;Pareto Front; probabilistic coverage; reliability; SCP; WSNs. Steganography is the science that involves communicating secret message in a multimedia carrier. On the other hand, steganalysis is the field dedicated to detect whether a given multimedia has hidden message in it. The detection of hidden messages is revealed as a classification problem. To this end, this paper has two contributions. Up to the best of our knowledge, this is the first time todefine grayscale image steganalysis, as a fuzzy c-means clustering (FCM) problem. The objective of the formulated fuzzy problem is to construct two fuzzy clusters: cover-image and stego-image clusters. The second contribution is to define a new detector, called calibrated Histogram Characteristic Function (HCF) with HaarWavelet(HCF^HW). The proposed detector is exploited, by the fuzzy clustering algorithm, as a feature set parameter to define the boundaries of the cover- and stego- images clusters. Performance evaluations of FCM with HCF^HW in terms of accuracy, detection rate, and false positive rate are investigated and compared with other work based on HCF Center of Mass or HCF-COM andcalibrated HCF-COM by down sampling. The comparison reveals out that the proposed FCM with (HCF^Hw)significantly outperforms other work.إخفاء المعلومات هو العلم الذي يتضمن نقل رسالة سرية مضمنة في الوسائط المتعددة. من ناحية أخرى، تحليل الأخفاء هو الحقل المخصص لاكتشاف في ما إذا كان الوسط المتعدد يحتوي على رسالة مخفية أو لا. يمكن اعتبار عملية الكشف عن الرسائل المخفية مشكلة تصنيف. لذلك، فإن هذا البحث يسهم في أمرين. أولا، تحليل الأخفاء في الصور الرمادية،باستخدام خوارزمية التجمع الضبابي ال (FCM).إن الهدف من استخدام خوارزمية التجمع الضبابي في الكشف هو تكوينمجموعتين من التجمع الضبابي هما: مجموعة الصور التي لا تحتوي على بيانات مخفيةومجموعةالصور التي تحتوي على بيانات مخفية. الاسهام الثاني, هو تعريف كاشف جديد بالإعتمادعلى طريقة تحليل الموجات من نوع هار (Haar Wavelet) يسمى (HCF^HW) لتحديد مجموعة ميزات يتم استخدامها لاحقاً مع خوارزمية التجمع الضبابي المقترحة (FCM)، لتحديد مجموعة الصور التي لا تحتوي على بيانات مخفية والمسماة (Cover Images ) من الصور التي تحتوي على بيانات مخفية والمسماة (Images(Stego. تم التحقق في تقييم أداء ((FCM معHCF^HW)) من حيث الدقه ومعدل الأكتشاف ، ومعدل الإيجابية الكاذبه ومقارنتها مع غيرها من الأعمال على أساس مركز كتلة (HCF) أو (HCF-COM) وتحديد (HCF-COM)بواسطة الاختزال((Down-sampling. وتبين المقارنة إلى أن (FCM) المقترح مع (HCF^HW) يتفوق بشكل كبير على الأعمال الأخرى. Clustering --- Fuzzy C-means clustering --- Histogram characteristic function --- LSB matching --- LSB replacement --- Steganalysis --- Steganography. Authentication is the process of determining whether someone or something is, in fact, who or what it is declared to be. As the dependence upon computers and computer networks grows, the need for user authentication has increased. User’s claimed identity can be veriﬁed by one of several methods. One of the most popular of these methods is represented by (something user know), such as password or Personal Identiﬁcation Number (PIN). Biometrics is the science and technology of authentication by identifying the living individual’s physiological or behavioral attributes. Keystroke authentication is a new behavioral access control system to identify legitimate users via their typing behavior. The objective of this paper is to provide user authentication based on keystroke dynamic in order to avoid un authorized user access to the system. Naive Bayes Classifier (NBC) is applied for keystroke authentication using unigraph and diagraph keystroke features. The unigraph Dwell Time (DT), diagraph Down-Down Time (DDT) features, and combination of (DT and DDT) are used. The results show that the combination of features (DT and DDT) produces better results with low error rate as compared with using DT or DDT alone.المصادقه هي عملية تحديد ما إذا كان شخص في الواقع هو كما أدعى أن يكون. بما أن الاعتماد على أجهزة الكمبيوتر وشبكات الكمبيوتر قد ازداد هذا ما ادى الى ازدياد الحاجة للمصادقة حيث ان الهوية التي يدعيها المستخدم ممكن اثباتها بعدة طرق شائعه ، واحدة من أكثرهذه الطرق شعبية يمثله (شيء يعرفه المستخدم)، مثل معرفة كلمة السر أو رقم التعريف الشخصي. المقاييس الحيوية هي العلم والتكنولوجيا للمصادقه من خلال تحديد السمات الفسيولوجية أو السلوكية للفرد وان المصادقة من خلال تميز ضغطة المفاتيح هو نظام جديد لمراقبة سلوكية الدخول لتحديد المستخدمين الشرعيين عبر كتابة كلمة السر. في هذا البحث يتم تطبيق مصنف نيف بايز للمصادقة واثبات هوية المستخدم والخصائص المستخدمه هي وقت ضغطة المفتاح كخاصيه احاديه والخاصيه الثنائيه وقت ضغطة المفتاح الى وقت ضغطة المفتاح الذي يليه ومره اخرى بالدمج بين الخاصيه الاحاديه والخاصيه الثنائيه وبينت النتائج بأن الحاله الاخيره توصلت الى نتائج افضل وبأقل خطأ ممكن. Biometric --- Down-Down Time --- Dwell Time --- Keystroke Dynamics --- Naïve Bayes --- User Authentication. The source and channel coding for wireless data transmission can reduce distortion, complexity and delay in multimedia services. In this paper, a joint source-channel coding is proposed for orthogonal frequency division multiplexing - interleave division multiple access (OFDM-IDMA) systems to transmit the compressed images over noisy channels. OFDM-IDMA combines advantages of both OFDM and IDMA, where OFDM removes inter symbol interference (ISI) problems and IDMA removes multiple access interference (MAI). Convolutional coding is used as a channel coding, while the hybrid compression method is used as a source coding scheme. The hybrid compression scheme is based on wavelet transform, bit plane slicing, polynomial approximation model and absolute moment block truncation. The wavelet transform is exploited to decompose the image into approximation and detail sub bands, while the polynomial model is used to code the approximation image band. Simulation results show that the proposed system reduces distortion efficiently (i.e., preserving image quality) and achieves a simple method for image multiuser transmission over wireless channels. ترميز المصدر والقناة لنقل القيم لاسلكيا يمكن أن يقلل التشويش والتعقيدات وكذلك التأخير في خدمات الوسائط المتعددة. في هذا البحث، تم أقتراح ربط ترميز المصدر و القناة لأنظمة (OFDM-IDMA) لنقل الصور المضغوطة عبر القنوات المشوشة. يجمعOFDM-IDMA بين مزايا كل من OFDM و IDMA ، حيث OFDM يزيل مشاكل التشويش المتداخل ISI بينما IDMA يزيل مشاكل الوصول المتعدد MAI. الترميز التقليدي تم أستخدامه كترميز للقناة بينما طريقة الضغط الهجين تم أستخدامها كنموذج لترميز المصدر.نموذج الضغط الهجين يستند على تحويل المويجات، بت تقطيع المستوي ،نموذج متعدد الحدود التقريبي والتقطيع اللحظي المطلق للبلوك. النموذج يستفاد من (WT) لتفكيك الصورة الى التقريب ومناطق تفاصيل الفرعية بينما نموذج المتعدد الخطي تم أستخدامه لترميز مناطق الصور المقربة. نتائج المحاكاة أظهرت بان النظام المقترح يقلل التشويش بشكل كفوء ( يحفظ جودة الصورة) وينجز طريق بسيط لنقل الصور لعدة مستخدمين عبر القنوات اللاسلكية. OFDM-IDMA --- Joint source-channel coding --- Wireless image transmission. In this paper a two dimensional numerical simulation have been applied using MATLAB program for generating Fraunhofer diffraction pattern from different apertures. This pattern is applied for three types of apertures, including, circular, square, and rectangular functions, and it's could be generated any wavelength in the visible light. The studying demonstrated the capability and the efficiency of optical imaging systems to observe a point source at very long distance. The circular aperture shows better results across the shape of Fraunhofer pattern and optical transfer function (otf). Also, the minimum values of the normalized irradiance of different diffracted apertures have been computed at different dimensions of these apertures, and found that the smallest value belongs to the circular aperture and equal to (1.0×10-8) at radius (R=60 pixel). في هذا البحث طبقت محاكاة عددية ذات بعدين باستخدام برنامج الماتلاب لتوليد نموذج فرانهوفر للحيود ولفتحات مختلفة. طبق هذا النموذج لثلاث فتحات تتضمن دوال الدائرة, المربع, والمستطيل ويمكن توليده لاي طول موجي في الضوء المرئي. بينت الدراسة القدرة والكفاءة لانظمة التصوير البصرية لرصد مصدر نقطي عند مسافة بعيدة جداً. اظهرت الفتحة الدائرية افضل النتائج عبر شكل نموذج فرانهوفر ودالة التحويل البصرية. فضلاً عن ذلك حسبت اقل قيمة للشدة المعايرة لحيود الفتحات وعند ابعاد مختلفة ووجد ان اقل قيمة تعود للفتحة الدائرية وتساوي (1.0×10-8) عند نصف قطر(R=60) بكسل. Fraunhofer diffraction --- Fourier transform --- and optical physics. One of the most important of satellite image is studying the surface water according of its distribution and depth. In this work, three images have been taken for Baghdad and surrounding for year (1991, 1999 and 2014) and by using of envi program has been used. Different classes have been evaluated for Al-Habania and Al-Razaza River according to its depth and water reflectance. In the present work four types of water depth (very shallow, shallow, moderate, and deep area) have been detected. تكمن اهمية الصور الفضائية في دراسة المياه السطحية لمعرفة خواصها من حيث التوزيع والأعماق. في هذا العمل تم اخذ صورتين لمنطقة بغداد ومحيطها للسنوات (1991, 1999 و 2014) وبااستخدام برنامج envi. وقد تم الحصول على مناطق مختلفة لسطح المياه لبحيره الحبانيه والرزازه اعتمادا على الاعماق وانعكاسات المياه حيث تم الحصول على اربع مناطق (جدا ضحله, ضحله, متوسطه, وعميقه) في هذا العمل. The wind atlas analysis and application program, WAsP, is used to assess wind energy potential, wind climate from geostrophic winds of a given area. In this paper, metrological data from Ali Algharby station was used to predict the wind resource and wind turbine energy production at Ali Algharby site. Data from metrological station was used to draw up observed wind climates at the anemometer site. Site contour map was digitized using WAsP Map Editor tool. Observed wind climate, digitized contour map, terrain roughness length, obstacle groups and their porosity were used as input to the WAsP model. Vestas V182, 1.65 MW turbine was used. Weibull probability distribution graph of wind speed, power density were drawn. A directional wind rose for January to December 2011 were drawn for site. Results showed that the studied area have Annual Energy Production (AEP) about 5 GWh as mean value. The calculation was obtained at 70 m hub height for the turbine and the roughness length (0.0, 0.03, 0,1,0,4, 1.5) m for the selected area. برنامج تحليل وتطبيق أطلس الرياح WAsP، يستخدم لتقييم مكامن طاقة الرياح، مناخ الرياح، من الرياح الجيوستروفية للمنطقة المحددة. في هذا البحث فان البيانات الأنوائية من محطة علي الغربي استخدمت لتخمين مصادر الرياح والطاقة المنتجة في موقع علي الغربي. بيانات المحطة الانوائية استخدمت لرسم مناخ الرياح المرصود عند موقع الانيمومتر. الخرائظ الكنتورية للموقع رقمت باستخدام الاداة WAsP Map Editor. مناخ الرياح المرصود ، الخرائط الكنتورية المرقمه، طول خشونة التضاريس، مجموعة العوائق ونفاذيتها استخدمت كمدخلات لنموذج WAsP. توربين الرياح Vestas V82 (1.65 MW) استخدم كتوربين مناسب. منحني احتمالية توزيع ويبل لسرعة الرياح وكثافة الطاقة رسمت. وردة الرياح لشهر كانون الثاني لغاية شهر كانون الاول 2011 رسمت للموقع. بينت النتائج ان منطقة الدراسة تمتلك انتاج طاقة سنوي تقريباً (5 ميكا واط. ساعة) كقيمة متوسطه. الحسابات استحصلت على ارتفاع (70) متر لمحور التوربين، وطول الخشونة (0،0.03،0.1،0.4،1.5) متر للمنطقة المحددة. WAsP Model --- Weibull Distribution --- Power Density --- wind climate --- energy production.